Chilling out in the French countryside. I'd packed dried starter, my scale and scrapers. Found locally grown and milled spelt and wheat flours. And decided to give things a go, using the do-nothing recipe that Abe (Lechem) had kindly shared with me. 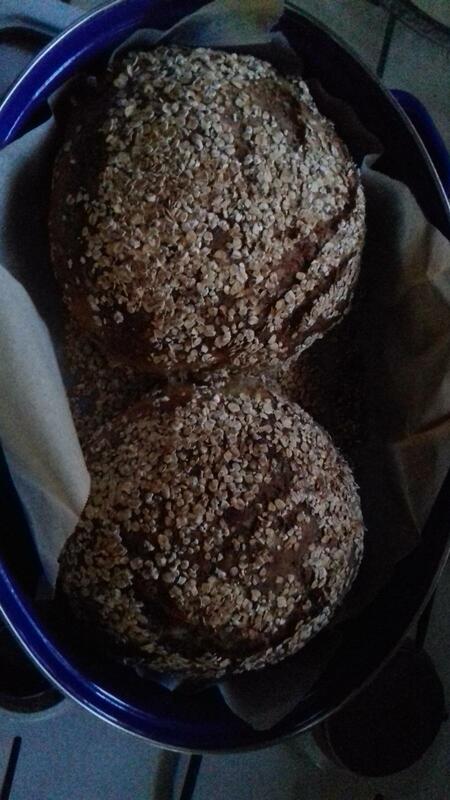 Earlier in the week, I attempted Danni's honeyed spelt and oat loaf. 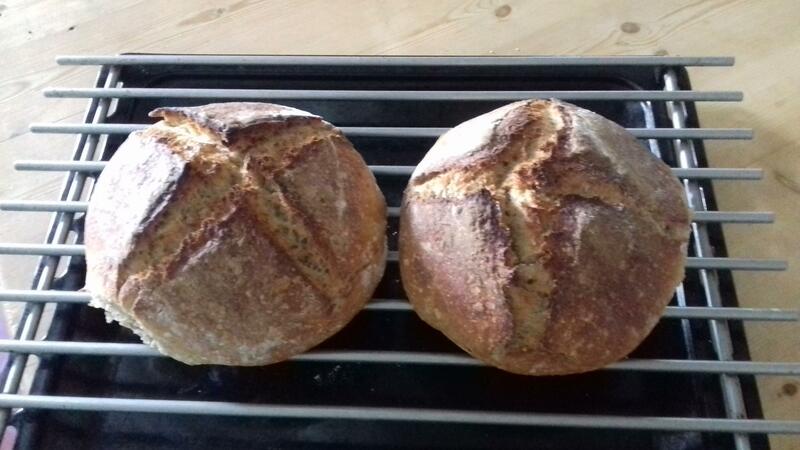 Because of the heat (over 30°C), I was afraid of over proofing, so probably went too short on the bulk ferment. 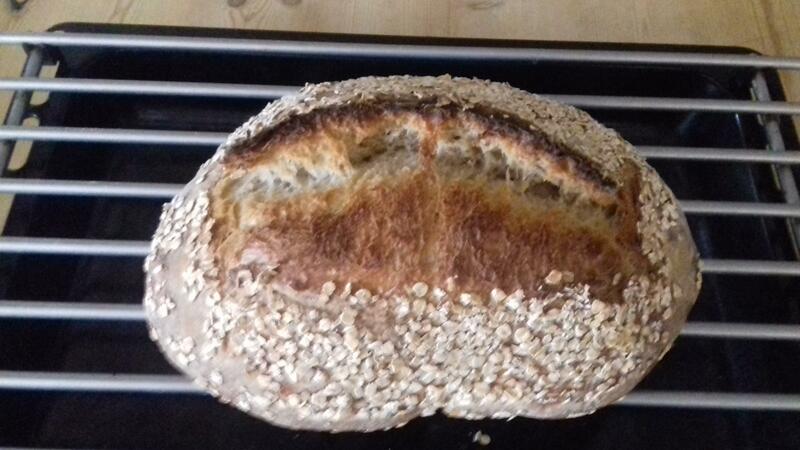 Crumb was too tight, but the taste was great. And I hadn't quite figured out the oven. So I'm trying this one again. Just mixed the levain and made the soaker. especially if it is flour you don’t usually use. Holiday bakes are fun!! Yeah, unknown flours and this is the first time I've ever used/tasted spelt! Unknown electric oven, much more sophisticated than the gas oven I have at home. But there was a big turkey roaster, which was a treat to play with. Gotta love doing some baking while on holiday! since I live in Paris. But this is the southwest -- foie gras country. I don't do that stuff anymore, but it sure was fun! Fortunately, I had my notebook with me with recipes that I wanted to try. It's also supposed to contain notes from my bakes, but I'm very undisciplined in that department. I do need to get better. So, before leaving, there was one more batch of honeyed spelt. 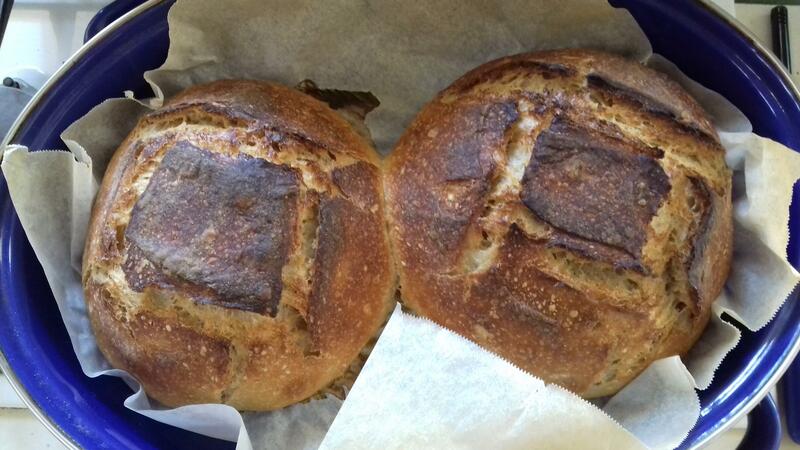 I didn't score, hoping that the seams would open up naturally, but my bread was seamless. How weird is that? And then, as a last blast and using up all of my travel starter, I tried the Teresa Greenway blister-crust potato-water bread. But I screwed up my planning and retarded the bulk instead of the final proof, which was what the recipe called for. And I didn't have a spritzer, so brushed on layers of water, so I missed out on big blisters. Will need to try that again. And the potatoes got sautéed in a bit of duck fat and loads of garlic and parsley! All in all, a most relaxing and restful vacation with perfect weather in a corner of France that we know and love. And hubby got a chance to rest fully from his pacemaker operation. So all is well. I'm so bummed to have missed out on all the fun with the community bake, though! That is one well equipped vacation kitchen too! I'm surprised the brushing on of the water didn't blister the bread more since that is what she does too! Enjoy the French countryside way better than Paris. Agree with you about the French countryside. If we knew then what we know now, we'd have played our cards differently and bought something before high-speed trains and the internet turned this region of France into a suburb of Toulouse and Bordeaux. Gotta try the blister crust again. Really wanted those cool blisters. Happy baking to you too.